My ronman athletes often ask me what race provides the best opportunity to get an Ironman qualifying slot. In this article I will provide some tips that I have become aware of over the years. The qualifying process is such that if you are unlucky the best athletes in your age group may also show and even with your best race you may not qualify. But the next qualifier may be different and your chances to get a qualifying slot may be much better. Read these tips and send me an email about my ranking of qualifiers with some hard data. This data is the result of a research project I embarked on a few months ago. Qualifying slots are allocated to a number of qualifying races. Some have many and some have just a few. Furthermore the slots are allocated to each age group usually based on the number of athletes registered or competing in the age group. As an example let's say that the 40-44 age group has been allocated 5 qualifying slots. This means that the athletes finishing in the top 5 positions are guaranteed a slot. However, should these athletes choose not to take the slot or if they have already qualified then the next place athlete can claim the qualifying slot. This process is generally called the roll down. The race web site tells you the total number of slots and some will tell you how many allocated to each age group. Races like Ironman Canada, Ironman Lake Placid and Ironman Germany usually have the most slots at 100 or more. If you have a sport which you are stronger at then choose a race that gives you a bigger advantage. If you are a strong swimmer choose a qualifier that has an ocean and non-wetsuit swim. If cycling is your sport choose a qualifier with a tough bike course like Ironman Lanzarote. You will be able to put more time into the competition this way. The same thing applies for to the run. The tougher the run the better the runners do. Furthermore, if swimming is your achilles tendon then choose a longer distance qualifier were the swim becomes a much less percent of the total race. Athletes that are swimming challenged will be wise to race a full Ironman if they do not mind the possibility of doing more than one Ironman in a season. This is not an intuitive approach as the swim will be long but in an Ironman you will have plenty of time to catch up after you get out of the water. Ironman slots are usually allocated per age group. The more athletes in your age group the more slots allocated. However, this varies from race to race. Check the race website or call the race director to find how many slots are allocated to your age group. Some races allocate slots after registration closes or sometimes on race week. However, you can find out how many were allocated the previous year. This can make a huge difference. Older age groups can sometimes have twice as many slots from one race to another. Make sure you find out ahead. This slogan is true for sales and real estate and I find it applies to Ironman qualifying as well. Popular triathlon destinations with large triathlete populations usually have very competitive qualifying races. Racing in more remote qualifying races or in foreign non-European races usually results in a weaker race field thus improving your chances. This also sometimes means a remote race would have less qualifying slots but not always true. The first qualifier of the season tends to be fairly competitive and usually favors those athletes that have been training over the winter. So if you live in a warm weather and stayed fit over the winter then give it a try. Otherwise train and get ready for a later qualifier. The last qualifier of the season usually results in the best chance to qualify as many of the fast athletes have already qualified and the qualifying slots can roll down far into the standings. If qualifying was entirely an odds game then it would make sense to just go to as many qualifiers as possible until your number came up. Going to more qualifiers would also work if you are very close to qualifying and missed getting a slot by a few minutes or seconds. On the other hand many athletes need to have their best races to qualify. This means that your training program should peak you for the qualifier to give you your best chance. Given the qualifying racing season I would recommend at least 2 races perhaps 3 races to qualify. I recommend a combination of ½ Ironman qualifiers and a full Ironman distance qualifier. Two full distance qualifiers is also an option but make sure they are spaced far apart to allow recovery and good performance at both. My suggestion would be a combination of ½ Ironman qualifiers with one full Ironman distance race. Looking at the finishers in 2004 a little over 200 of them qualified at the ½ Ironman distance. I generally like this way of qualifying to minimize the Ironman wear and tear and it also allows athletes to have their peak training volume for Hawaii only. The problem with qualifying at the ½ Ironman distance is that it requires a somewhat different kind of athlete to excel at it. I have known many very capable Ironman distance athletes who have a very difficult time getting a spot at a ½ Ironman distance. Being a strong swimmer is very important at this distance. It is very hard to make up more than a few minutes to top swimmers. The other thing that complicates matters is that ½ Ironman distance qualifying races have very few slots. Athletes almost have to win or at the very least be on the podium to get a qualifying slot. Of course this is almost always the case for woman at all qualifiers but it is also true for men at the ½’s. It is very common for athletes to look at the last qualifying time at a race to figure out if he/she is capable of that time which would most likely mean a qualifying spot the following year. I would not advice on this method. Take for example Ironman Coeur D’Alene in 2003. 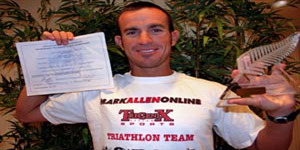 Race conditions were the worst and the DNF percentage the highest for an Ironman. Times were very slow. Find about the race day conditions before assuming that any given race is easier to qualify. To do your best at the qualifier you have to start specific training at the right time. Considering all the factors I mention above, select the race that you think will favor you the most. Mark the date in your calendar and count 20 weeks back. This is when you should start specific training. Ideally if you take my advice you can do a ½ Ironman dry run qualifier 10 weeks or so into the 20 week period. The dry run will expose aspects of the race you may need to work on. Then the next 10 weeks will be plenty of time to make corrections for your optimal qualifier and your best chance to qualify. Qualifying for an Ironman is certainly something to be proud off. However, the process of qualifying can leave out some very capable athletes because they choose races that do not favor them. There are things you should think about to improve your chances. Be smart and consider my suggestions.